Ayushman Bharat Yojana is a special health protection program which has been launched by the PM Modi on 23rd September 2018 from Jharkhand. Under Ayushman Bharat Yojana, there would be more than 1350 diseases would be covered. More than 6 Crore people would get benefit from this Health scheme. The central government of India has also asked the Odisa Govermnent to take participation in the Ayushman Bharat Yojana health scheme. This Yojana has been started nationwide and thousands of people have availed the benefits already within 24 hours. Under this scheme, all the eligible families would be get Rs. 5 lakh Insurance coverage benefit per year. The benefit would not be limited to any Branch or particular hospital. There would be cashless treatment facility for all the patients and patient can visit any private or private hospital for the treatment purpose. Good health is really needed and there are several people fighting against various types of diseases. The rich people can easily visit the Top hospital and get rid of their health problems. But, poor people face a lot of problem as they have to arrange money first for their treatment. For those poor people, Ayushman Bharat Yojana would be very important. Under this Yojna, there would be two Major Health sectors which include Health and Wellness centres and National Health protection scheme. Establishment of the Health and Wellness centers at nearest locations so that patients do not have to travel so far. You do not have to fill any application form or any types of registration process to get enroll into it. Department would identity the scheme beneficiaries and would send letters to them. Step 1 : Go to the official website https://www.abnhpm.gov.in/ and click on AM I ELIGIBLE like Mark shown in the below image. 1) On the landing page there will be a button Called AM I Eligible,Click on it, Next the user has to enter an active mobile number (to receive an OTP) and enter the Captcha letters displaying on the screen and click on the “Generate OTP” button. After this, the user will receive an OTP as a text message on the mobile number entered. 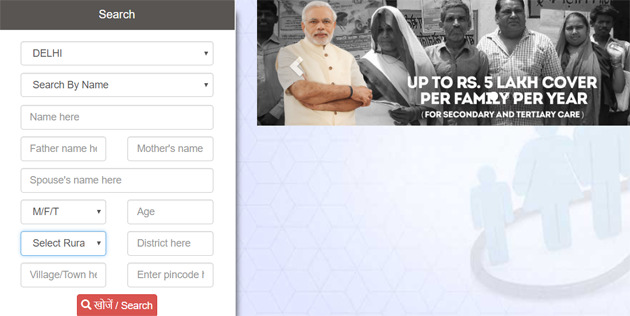 The user has to enter this OTP and click on “Verify OTP” which directs to a page to enter the details for search. a) Mobile number/Ration Card Number: An Additional Data Collection Drive (ADCD) was conducted on 30th April 2018 at Gram Sabha’s across India to capture active mobile number and ration card number of a family of the Socio-Economic Caste Census (SECC) database. If the individual got his/her Mobile number or Ration card number captured during this drive, only then it will show results on the portal. If the individual got his details captured during the ADCD drive and still no results are displayed, then the “SECC Name” option should be used for searching. b) SECC Name: An individual can search if he/she is eligible for PMJAY using his details as per the SECC database such as Name, Father’s Name, Gender, State etc. Even now, if no results are displayed, then the user should contact a nearby Ayushmaan Mitra. c) RSBY URN : Additionally, all active families that are enrolled under RSBY (till 31st March, 2018) that do not feature in the targeted groups as per SECC data will be included as well and can identify if they are eligible for PMJAY using RSBY URN. Click on Family Details Button it will display all your family members details like Below Screen shot. 3) If the search is successful, the individual has an option to receive a text message with the HHID number/RSBY URN for future purposes on his/her phone by clicking the “Get SMS” button and entering the mobile number. Note: This mobile number can be different from the mobile number used in the first step for OTP Generation.